PSInvestor grants you a limited, revocable, non-exclusive, non-transferable license to view content on the Site for personal and non-commercial purposes. PSInvestor grants the operators of public search engines a limited, non-exclusive, non-transferable license to copy materials from the Site for the purpose of creating publicly available, searchable indices of Site content. You agree not to modify, damage, disrupt, disable, overburden, impair, alter or interfere with the use, features, functions, operation, security or maintenance of the Site or the rights or use and enjoyment of the Site by any other person or entity in any manner. No portion of PSInvestor.com may be duplicated, redistributed or manipulated in any form without our consent, violators will be prosecuted to the full extent of the law. Articles and press releases mentioned by PSInvestor will always disclose if any affiliated owners of the website has a position (Long/short) in the mentioned company. The affiliated owners reserve the right to trade in and out of the security after the release of the article. The Content provided on this Site is our own original content, syndicated content or is paid advertisements provided exclusively by our affiliate, Resources Unlimited NW LLC, an financial media and news marketing firm. If PSInvestor mentions a company that has entered into a service agreement with Resources Unlimited NW LLC, it will be NOTED on our disclaimer page and disclosed at the end of the article. The companies mentioned on the Site may or may not have not approved the content or timing of the information being published unless otherwise noted. We are not a financial advisor, investment advisor or broker-dealer and do not undertake any activities that would require such registration. You understand and acknowledge that there is a very high degree of risk involved in trading securities mentioned on PSInvestor. PSInvestor, the authors, the publisher, and all affiliates of PSInvestor (including their respective directors, officers and employees) assume no responsibility or liability for your trading and investment results. PSInvestor may receive fees for producing and presenting Content on this Site along with other media services. Our fees may be either a flat cash sum or negotiated number of securities of the companies featured on this Site, or a combination thereof. The securities are commonly paid in segments, of which a portion is received upon engagement and the balance is paid on or near the conclusion of the engagement. We note that this pay structure creates a pecuniary interest in increasing the stock price, which we may benefit from. PSInvestor has been compensated $5,000.00 via bankwire to Resources Unlimited NW LLC. aka (RU) Because of the affiliation and the mentioning of INTV (Integrated Ventures Inc.) on the PSInvestor website, we DISCLOSE this information. RU had a multi-month investor relation services agreement in Nov 2017-Jan 2018. PSInvestor has been compensated $5,000.00 via bankwire to Resources Unlimited NW LLC. aka (RU) Because of the affiliation and the mentioning of DATI (Digital Arts Media Network) on the PSInvestor website, we DISCLOSE this information. RU had a 3 month investor relation services agreement in Jan 2018- April 2018. 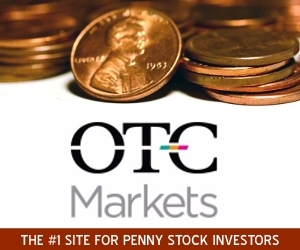 PSInvestor.com is not an investment advisory service, nor a registered investment advisor or broker-dealer and does not purport to tell or suggest which securities customers should buy or sell for themselves. None of the Content on the Site shall constitute a recommendation to buy, sell, or hold that or any other security, financial product or investment discussed herein. As with any investment, the featured companies on the Site or in any communication to you involves a high degree of risk and volatility, and all investors should know that they may lose a portion or all of their investment if they decide to purchase any financial instrument and/or security. Neither the U.S. Securities and Exchange Commission nor any state securities administrator has reviewed or approved the information presented on this Site or passed upon the merits, accuracy or completeness of any of the Content. PSInvestor, its affiliates, employees, directors and agents make no representations, warranties or guarantees as to the accuracy or completeness of the disclosure by the featured companies and does not guarantee the topicality, correctness, completeness and quality of information and statements presented on the Site or in any email alerts, newsletters or other such communications. You are strongly advised to and agree to consult a financial advisor and to independently diligence any contemplated investment. You further understand and hereby agree that the Site does not offer or provide any investment advice or opinion regarding the nature, potential, value, suitability or profitability of any particular security, portfolio of securities, transaction, investment strategy or other matter. You hereby agree that any investment decisions you make will be based solely on your evaluation of your financial circumstances, investment objectives, risk tolerance, financial condition, and liquidity needs. You acknowledge, understand and agree that small and micro-cap stocks are high-risk investments and that you may lose the entirety of your investment, and further that PSInvestor shall not be responsible or liable for any trading or investment decisions made based on such information. Mention of third-party products, companies and web sites on the PSInvestor.com Site is for informational purposes only and constitutes neither an endorsement nor a recommendation. PSInvestor.com assumes no responsibility with regard to the selection, performance or use of these products or vendors. PSInvestor.com provides this only as a convenience to our users. PSInvestor.com has not tested any software found on these web sites and makes no representations regarding the quality, safety, or suitability of any software found there. There are dangers inherent in the use of any software found on the Internet, and PSInvestor.com assumes no responsibility with regard to the performance of use of these products. Make sure that you completely understand the risks before retrieving any software on the Internet. All third party products must be ordered directly from the vendor, and all licenses and warranties, if any, take place between you and the vendor. PSInvestor does not represent or warrant the reliability or accuracy of any Content distributed through or accessed from the Site, and has not performed any investigation into such Content. To the fullest extent permissible by law, PSInvestor assumes no liability or responsibility for any errors or omissions in the Content provided on this the Site. PSInvestor.com provides the information and data presented on this Site “AS IS”. PSInvestor.com expressly disclaims all warranties and/or conditions, express or implied, as to any matter whatsoever relating to or referenced by this Site, including, but not limited to, the implied warranties and/or conditions of merchantability or satisfactory quality and fitness for a particular purpose and non-infringement, or arising from a course of dealing, usage, trade or practice. PSInvestor.com shall not be liable for any technical inaccuracies or typographical errors, which this Site may contain. In no event will PSInvestor.com be liable to any party for any direct, special or other consequential damages for any use of this Site, or any other web site, including without limitation, any lost profits, business interruption, loss of programs or other data, even if PSInvestor.com is advised of the possibility of such damages. PSInvestor.com makes no representations whatsoever about any other web site which you may access through this Site. These web sites are independent from PSInvestor.com and we have no control over the content of other companies’ web sites. It is the User’s responsibility, not PSInvestor.com to take precautions to ensure the linked web sites are free of viruses or other items of a potentially damaging nature. The information contained in this Site is subject to change without notice. This Site is administered by PSInvestor.com or authorized developers of PSInvestor.com from their offices around the world. PSInvestor.com makes no representation that Materials at this Site are appropriate or available for use outside the United States, and access to them from territories where their contents are illegal is prohibited. You may not use or export or re-export the Materials at this Site or any copy or adaptation in violation of any applicable laws or regulations including without limitation U.S. export laws and regulations. If you choose to access this Site from outside the United States, you do so on your own initiative and are responsible for compliance with applicable local laws. These terms and conditions will be governed by and construed in accordance with the laws of the State of Nevada, without giving effect to any principles of conflicts of laws. 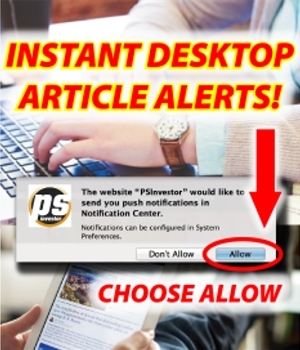 PSInvestor.com respects the privacy of users of this Site and believes that such information should be used responsibly and appropriately. In general, all users may visit this Site anonymously and without revealing any personal information. We may keep track of visitors’ IP addresses, the browser used and other related data. We analyze this data for trends and statistics. We may also collect information automatically provided to us by your browser about the type of computer and operating system you are using. This privacy statement does not extend to anything that is beyond the control of PSInvestor.com, and is not to be applied in any manner contrary to applicable policies, laws, rules or regulations. Any communication or material you transmit to PSInvestor.com via this Site, via electronic mail or otherwise, including any data, comments, questions, etc., will be treated as non-confidential and non-proprietary.